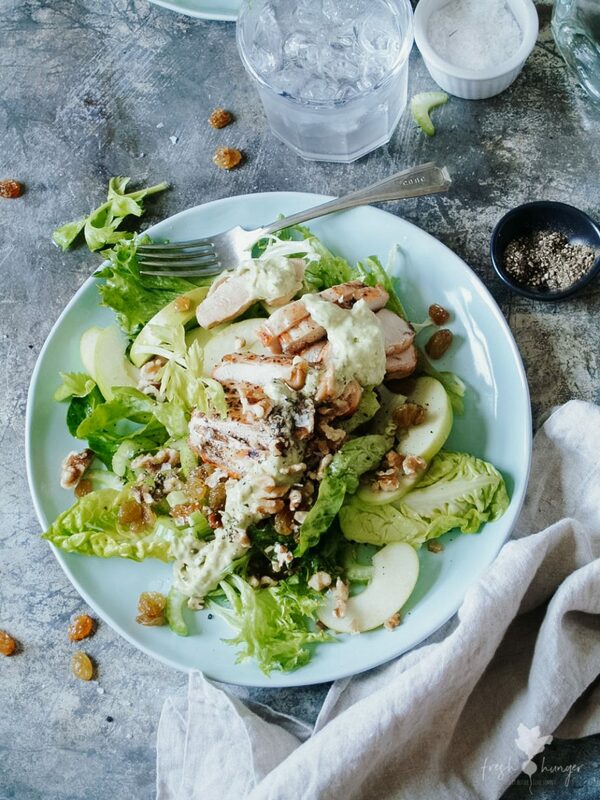 Chicken, Celery & Apple Salad with Avocado Ranch Dressing is a crunchy, vibrant salad & is low carb – perfect, if like me, you’re wanting to cut back on some unnecessary, unhealthy carbs. Don’t be scared off by the seemingly lofty list of ingredients. 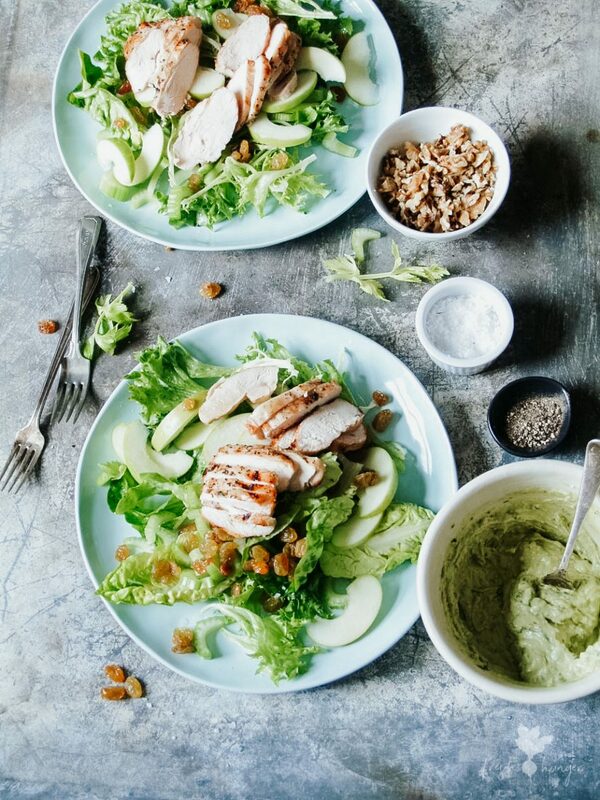 The dressing, which is quite spectacular, is simple & if you can scoop avocado from its skin, you can make the dressing. Then it’s as easy as grilling a couple of chicken breasts, chopping some celery & slicing a couple of apples. Et voila! Avocado ranch dressing – thick, creamy – & although was made for this salad would be the perfect dip for crudites – radish, carrot sticks, celery, peppers & such. 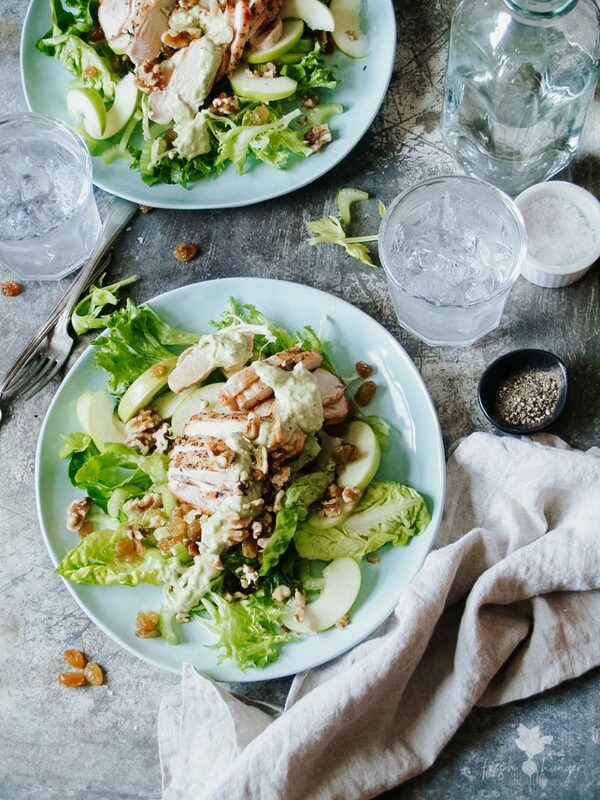 Cheaper & better for you than bottled dressing, homemade dressing is infinitely superior to something manufactured in a processing facility & forced into a bottle. Last night my husband & I enjoyed a dip in our pool. A little brisk initially but good for the body & the mind. There’s something about being in water that I find therapeutic on several levels. After a busy day, a swim & a wholesome dinner, I slept soundly last night. Something I’ve been struggling with: sleep. Taken for granted by those who can lay their head down & drift into peaceful slumber, sleep hasn’t come easy to me over the last five or six years. It’s something I want to focus on improving. Losing weight, stretching, gentle exercise, being hydrated & some meditation of some kind will all help. Time to photograph anther healthier carb main meal – grilled eggplant with Moroccan beef. The days is warming & the humidity is high. I think another swim is in order. I’ve already had a lovely bike ride & the pool will be perfect for stretching my leg muscles. Is there such thing as aquatic yoga? There has to be. I need to look into that. Go into your week with a positive, grateful attitude. Move, eat something wholesome, get some rest. Enjoy the week. PS. 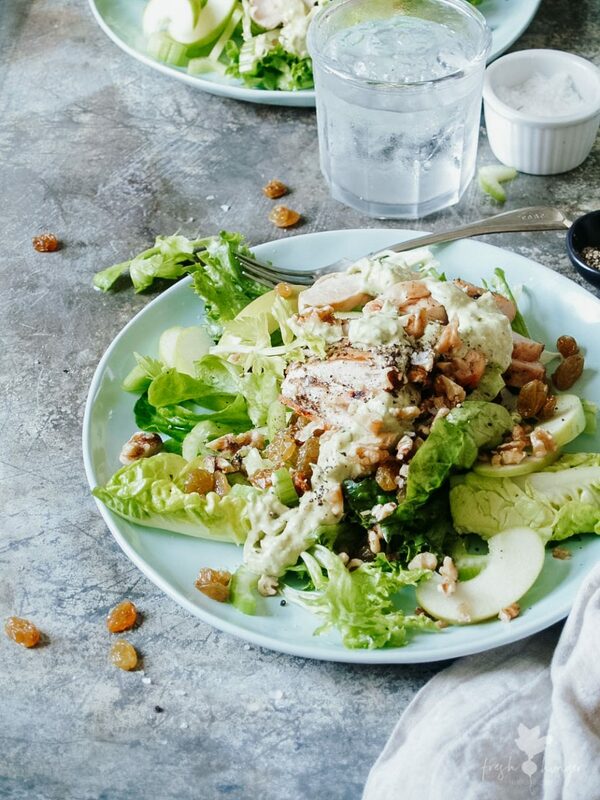 If you love salad as much as I do, you’ll enjoy this Mediterranean Grilled Chicken Salad. 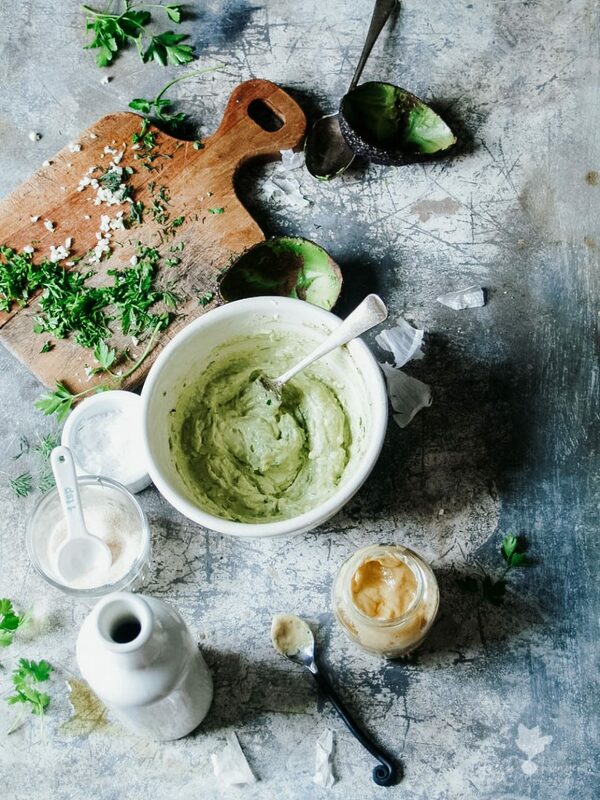 To make the dressing: mash the avocado with a in a small bowl. Whisk in the remaining dressing ingredients. Cover & place in fridge while you make the salad. To make the chicken salad: Sprinkle the chicken with salt & pepper. Cook on a greased grill (barbie) over medium-high heat for about 6 minutes each side, or until cooked thoroughly. Let stand for 5 minutes before cutting crossways into thin slices. Combine oil, vinegar & a pinch of salt & pepper in a large bowl. Add the lettuce, celery, apple slices & raisins. Toss to coat everything in the oil mixture. Arrange the salad on two or three plates or a serving platter. Top with chicken. Add water to dressing a tablespoon at a time until still thick but you can drizzle it. 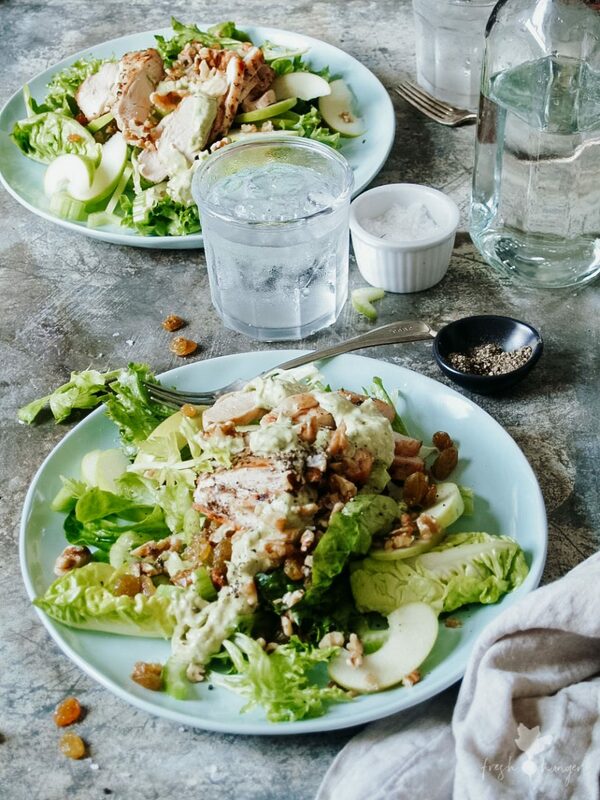 Drizzle the dressing over the chicken & top with walnuts. Serves 3.